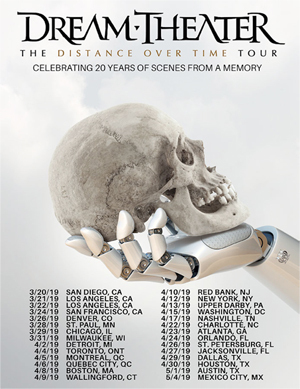 Two-time Grammy-nominated and millions-selling progressive music titans DREAM THEATER announce the forthcoming worldwide release of their 14th studio album, Distance Over Time on February 22, 2019. 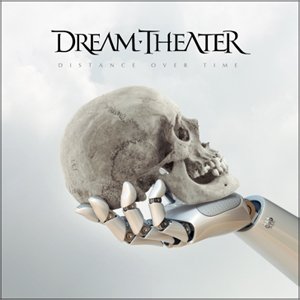 Distance Over Time showcases a newfound creativity for DREAM THEATER while maintaining the elements that have garnered them devoted fans around the globe. The album also marks the first for the band’s new label InsideOutMusic/Sony Music. The artwork was created by long-time cover collaborator Hugh Syme (RUSH, IRON MAIDEN, STONE SOUR). Distance Over Time was produced by John Petrucci, mixed by Ben Grosse and mastered by Tom Baker. “When I listen back to the album, I can distinctly recall every moment of the writing process; where I was standing in the room, what inspired us in that instant and the meaning behind each song. As a producer, my goal was to try and create the best-sounding DREAM THEATER record we’ve ever made so that listeners can just be enveloped in the music. I really wanted this recording to truly reflect the spirit, joy and passion that went into making the album and for people to walk away feeling some of the organic nature, personality and raw energy that the band captured while together in the studio. For me, I think it accomplishes that and I hope that other people will feel the same way,” explains John Petrucci. In June 2018, DREAM THEATER secluded themselves in a private location in upstate New York to begin writing for the new record. While spending the summer living together in the property's adjacent residence, the band spent their days and nights crafting the music that would make up the new album in the ‘Yonderbarn’; a beautiful and spacious barn that had been meticulously transformed into a state-of-the art film and recording studio. Following an intense & extremely productive period of group writing sessions and wanting to retain the magic that was captured in this scenic and inspiring location, they decided to record the album in the very room they had all convened to write together in. Living together during the writing and recording for Distance Over Time marked another first for the band’s 33-year career. The result is a heavier collection of songs that showcases the early roots of the band while exploring new territory as musicians and as friends. “It was like going back to summer camp,” adds James LaBrie. “Being around each other the whole time made it that much more of a profound experience. I think the songs reflect the energy. It was a lot of fun to have a situation so powerful at this point in our career.” It has been 3 years since DREAM THEATER released new music. To announce the details of the brand new album, DREAM THEATER enlisted the help of one lucky contest winner to break the news of the record to the loyal fans of the band. An Alternate Reality Game was launched that encompassed a “treasure hunt” whereby fans were able to search for clues hidden in various photos, videos, social media posts, and more. Ultimately, one lucky winner was given access to content before everyone else including the release date and cover artwork, and the winner would be the one to share the first taste of never before heard music. DREAM THEATER is also planning to hit the road in support of the new album. The Distance Over Time Tour of North America was recently announced and kicks off on March 20, 2019 in San Diego, CA. The tour will run for seven weeks before wrapping up in Mexico City on May 4, 2019. Information on tickets for all upcoming shows as well as VIP packages can be found at www.dreamtheater.net. More tour dates for the worldwide tour will be announced in the near future. ALICE COOPER Reveals More Headline Dates, New Stage Show "Ol' Black Eyes Is Back"
CELLAR DARLING Unveil Music Video For Fan-Voted Single "Drown"